These females just completed the transformation from nymph to adulthood, and they have their entire reproductive lives ahead of them. They are primed and ready for 18 to 20 months of continuous breeding. The Newly emerged adult female Dubia roach has a lot to look forward to. She has just transformed from immature nymph to adult female breeder. She spent months eating and storing the nutrients she’ll need for growth and reproduction, and she managed to avoid all the pitfalls of roach life so far. Now she has her entire reproductive life ahead of her. With a little luck, she’ll spend her remaining days eating and producing batches of new Dubia roach nymphs, month after month, for the next 18 to 20 months. 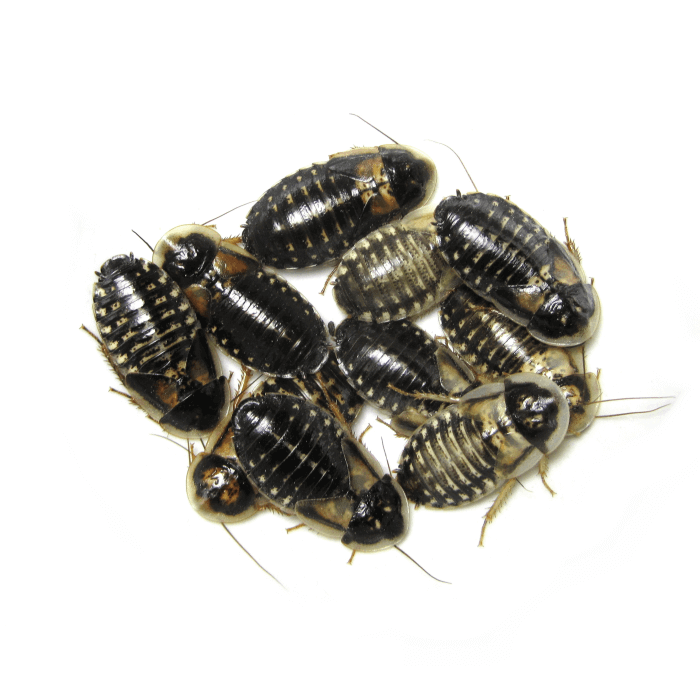 All of our roaches receive high quality, nutrient-dense foods designed to meet their nutritional needs at least in part because research confirms nutritionally primed females have longer reproductive lives, less downtime, larger clutches, healthier offspring, faster recovery, and lower mortality than those eating substandard diets. Through targeted nutrition, we provide everything they need at each stage of development. This means our adult females are strong, vital, and better able to withstand the rigors of breeding than their nutritionally challenged peers. 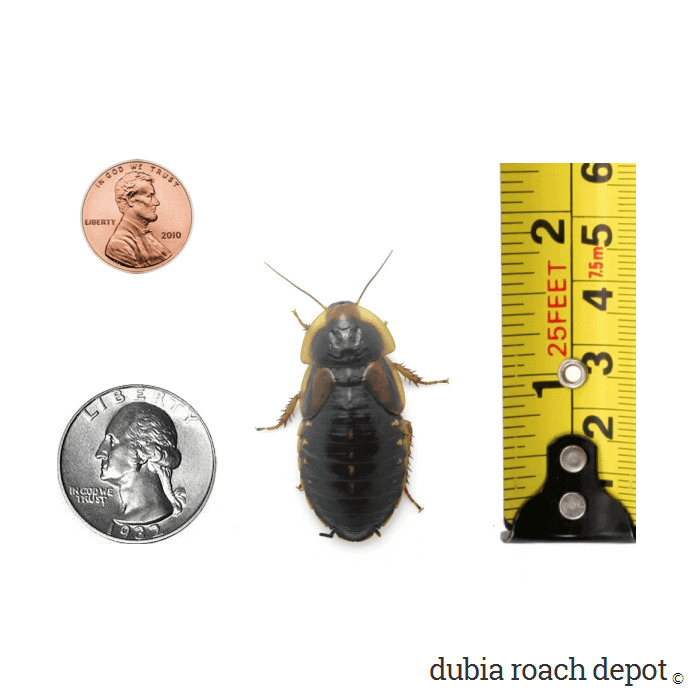 All things equal, proper nutrition is critical to successful Dubia roach breeding. 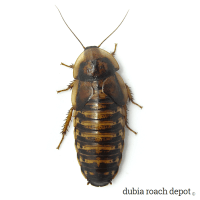 From day one, female Dubia roaches eat for two reasons: to grow and to build their nutrient stores for reproduction. And these stores are not a luxury. They’re a necessity. Under optimum conditions, females produce around 35 live offspring per cycle. Given a 45-day cycle, that comes to about 500 nymphs in a little over 1.5 years. That’s almost one nymph per female per day! As you might imagine, this takes a lot of nutritional support. And not just support from the food they eat in adulthood. It also comes from mobilizing nutrients they stored during the first four months of life as nymphs. The fittest females rest for only five to seven days between giving birth and mating. Low nutritional reserves correlate with slower recovery and poorer performance. On the other hand, fast recovery is associated with adequate nutritional reserves. This is why we put so much effort into nutritional research. So what’s the bottom line for you? Our New Adult Female Dubia Roaches have what it takes to succeed at breeding. All they need from here on out is a little time, proper breeding conditions, and a few males of course. 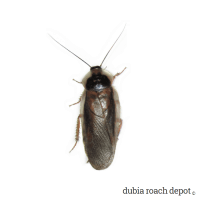 In our experience, the best way to create a large, thriving colony of big, nutritious Dubia roaches is to start with healthy stock and take good care of them from there. If we had just one piece of advice for people starting new Dubia colonies, it would be to start with the healthiest females they can find. There’s more to raising a colony than that, of course. But it’s very important to get healthy stock for a strong start. With Dubia roach females, what they are depends on their conditioning as nymphs. Once they reach adulthood, what they can become is pretty much baked in. You can’t make up for lost time! 5 stars (needs 10 though) I just received my 25 pack of newly emerged females (which was actually 28 due to the overcount they always add incase of any d.o.a., which by the way, I’ve never received a single dead roach from here) the females are beautiful and healthy and as soon as I added them to my colony I witnessed something I’d never seen before. Some males ran out and immediately began doing “the mating dance” long story short some of the new females are in the process of mating as I type this. I am so impressed. They were literally delivered ready to breed. Amazing. 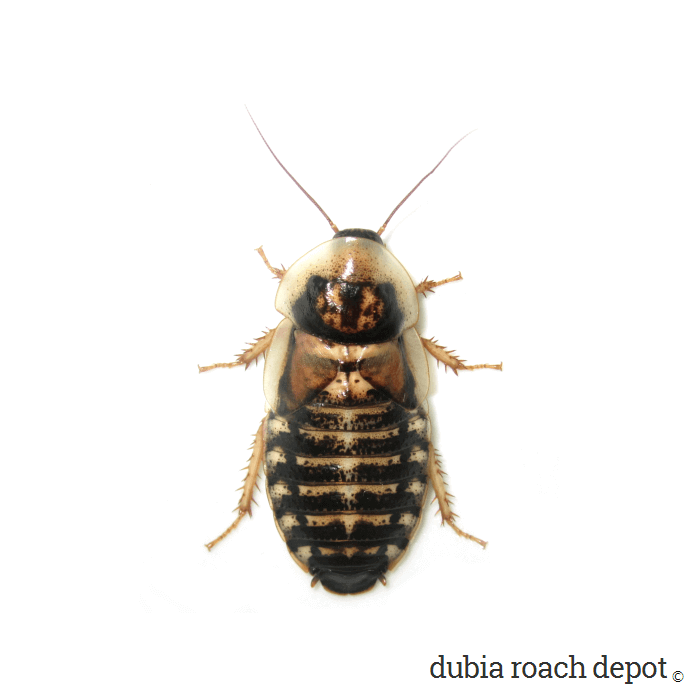 Love Dubia Roach Depot. Cant recommend them enough! Thanks DRD! 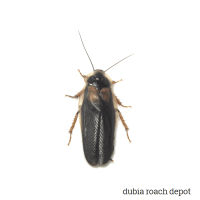 Superb Dubia roaches, first-rate service, great prices. Who could ask for anything more?